I have a bit of a cookbook fetish. For some people discretionary income is directed at shoes, manicures, or jewelry, for me, it’s cookbooks. Though I have some of my favorites listed in Essential References they are primarily spice-focused, so with the creation of a new blog category for books, I will occasionally share additional books that have captured my attention and appetite. 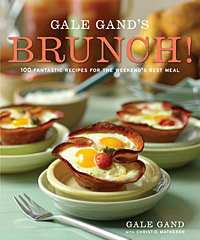 Gale Gand’s newest book, Gale Gand’s Brunch! : 100 Fantastic Recipes for the Weekend’s Best Meal , was just released this month perfectly timed for Brunch season, which seems to kick off with Easter and run through summer in my mind. Immediately taken with the cover photo, I started craving brunch and dove right in and got cooking. I have books that I have owned for years and though I love the book, have only made 2-3 recipes from them. Brunch! has been in my hands for just a few weeks and I’ve already made 12 of the recipes and fully intend to keep up the pace because I have so many pages flagged as “must-make.” Part of what makes the recipes in this book appealing to me is they aren’t complicated, and though I love a good complicated cooking challenge, for the first meal of the day I generally just want to eat and the sooner the better. Brunch! offers the best of both worlds with simple recipes that have a flair of elegance for special occasions, along with casual basics for everyday. Though Gale Gand is the Pastry Chef at the fine dining restaurant, Tru, this book comes from her perspective as a busy mom who enjoys relaxed weekend brunch gatherings with friends. The menu for our delicious Easter breakfast came right from the pages of this book. Rhubarb just started showing up at the market recently and I immediately added the Roasted Pears and Rhubarb with Orange recipe to our menu. 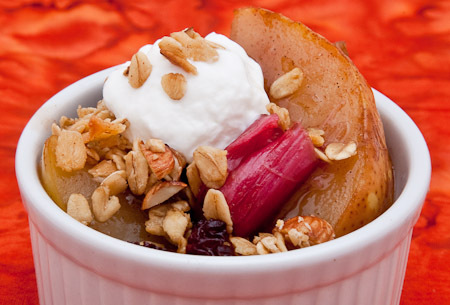 I topped the roasted fruit with the Cranberry-Almond Granola, also from the book, and a dollop of Greek yogurt. It was a perfect breakfast dessert! I do believe this granola recipe has sparked a new obsession and I will be making endless variations of this recipe. The granola is easy to make, delicious, and a beautiful gift when packaged in cellophane bag and tied with a ribbon. 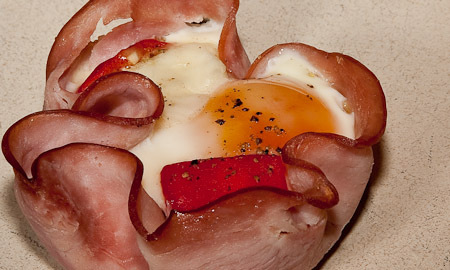 The cover recipe of Baked Eggs in Ham Cups, has been enticing me from the moment I saw it. I have actually made it twice and it’s a great example of the types of simple yet elegant recipes in the collection. I wasn’t able to get particularly large slices of ham and found it worked better to just cook one egg in each cup and roasted red peppers were a fine stand-in for the cherry tomatoes. 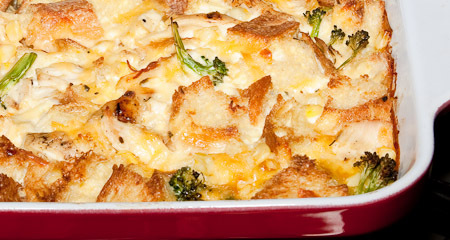 The Strata with chicken, broccoli, corn, chiles, and cheese is one of the best recipes for entertaining because it can be assembled the night before and just popped in the oven to bake in the morning. What is more comforting and delicious than a savory bread pudding? It’s creamy and custardy, but hearty and satisfying with a nice little kick from the addition of chile peppers. There are five variations included to illustrate the flexibility of the dish and creativity is encouraged. This is a great example of the types of practical recipes Gand includes that make it possible to entertain despite an overly busy schedule. Beyond a wide variety of savory breakfast foods Brunch! includes a wonderful collection of recipes that would make a delicious lunch like Apricot Chicken Salad, Farro with Tomatoes and Parsley, and Heirloom Tomato Bisque, all of which are on my “must-make” list. The only dish I didn’t have great success with was the Goat Cheese and Chive Hash Browns, but it was due to a cooking error on my part for trying to cook them on a griddle rather than in a pan that would afford the necessary oil for frying. The flavor was good; I just didn’t get them as crisp and delicious as they should have been. Gale’s pastry background comes through with a delicious collection of recipes for scones, waffles, muffins, turnovers and coffee cake. I have been drawn to the savory baked goods such as the Bacon-Scallion Scones, yes, bacon scones! I did find that when making only half of the recipe, it is best to divide all of the ingredients in half! The first time I made these I forgot to cut the milk in half and amazingly they still turned out, but I have since made them again and they are better when all the ingredients are scaled back equally. 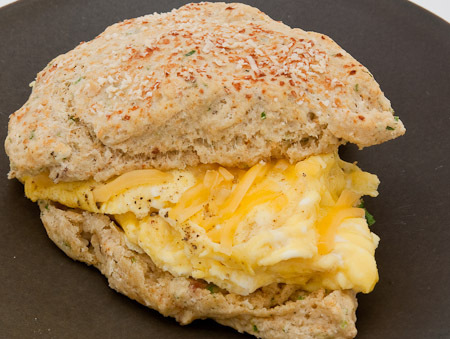 My favorite way to eat these scones is with a scrambled egg and cheese sandwiched in the middle. It’s a full breakfast in one delicious little package. The Gougères with hints of mustard and cayenne pepper are absolutely addictive! Each little dough puff is dressed with garlic parsley butter and a sprinkled of parmesan cheese just after they come out of the oven. After feasting on them at breakfast, that evening I popped the leftovers in the oven to crisp up and served them as hors d’oeuvre for dinner. There is a nice chapter of festive beverage recipes in the book as well. I love to make a special drink to serve when entertaining and for breakfast my favorite is to serve a smoothie to guests when they first arrive. I think of it as a breakfast appetizer. It gives guests something delicious to enjoy and keeps them from starving while the last bit of cooking is taking place. Brunch! 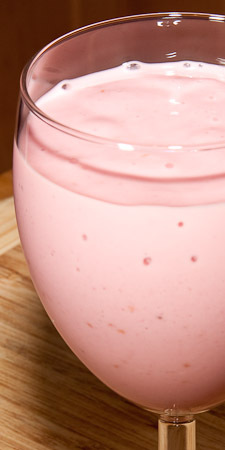 has a Blueberry Pineapple with Mint and a Raspberry Banana Orange smoothie that are both delicious and as simple as pushing the button on the blender. I found them both to be a little thick for my taste and just added a bit of milk to thin them out. Gale Gand’s Brunch! 100 Fantastic Recipes for the Weekend’s Best Meal, has been a fun book to cook from and has ignited my enthusiasm for inviting friends over for breakfast. In addition to great recipes, it is beautifully photographed and printed making it a great gift for anyone that likes to cook especially if it came with an invitation to brunch! Tomorrow morning maybe it will be Baked Cinnamon-Apple French Toast and this summer it will definitely be Watermelon Gazpacho with cucumber, apple, bell pepper and pomegranate seeds! Update: We have been given permission to share the recipe for Asparagus with Poached Eggs and Parmesan. Delicious! Update: Gale Gand will be cooking two dishes from this new book on NBC’s Today Show, Wednesday April 15th. Further update: Now it looks like she will be on Thursday April 16th. Tags: Brunch! This entry was posted on Monday, April 13th, 2009 at 2:36 pm	and is filed under Books. You can follow any responses to this entry through the RSS 2.0 feed. You can leave a response, or trackback from your own site. 3 Responses to Gale Gand’s Brunch! Seriously, Carol. You are killing me with these beautiful brunch pictures. David is one lucky man. sounds like a great cookbook. I’ll have to add it to my wishlist. Here is the link for my Tres Leches. i am still trying to catch up with all the blog posts. This is a fabulous one, pictures, recipes, and all!! !